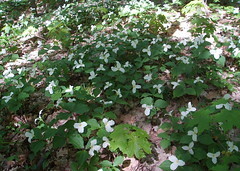 Camp Woodland Trails has 19 campsites which are spread out over 275 acres of breathtaking landscaping. 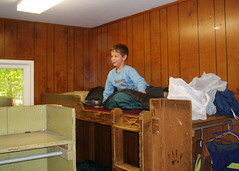 This weekend, my son and I stayed at Hickory Hills with his Beavers troop. 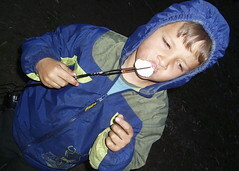 I remember these trips from when I was a Cub Scout, and it was as fun as I recall. 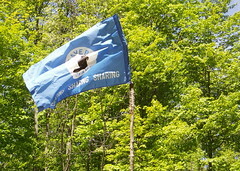 The weather was fantastic as we went on a scavenger hunt, learnt how to use our compasses by orienteering, enjoyed a traditional spaghetti dinner, exhausted ourselves on the obstacle course, played plenty of soccer, told stories and jokes by the campfire, roasted marshmallows, made smores, went on a long hike and closed out with a wienie roast. There were no computers, no televisions and no radios. It was just a jam-packed couple of days that James and I will never forget. I do, however, have one complaint. Sleeping in a single room with 17 Beavers and their dads isn't easy. I counted at least three snorers and one dude, sharing the bunk beside me, cranked out his snores at about 140 decibels. I didn't think I'd ever fall asleep. Next year, I'm bringing my tent and sleeping outdoors. I went nuts with the camera. Here's the Woodland Trails Scout Camp photoset and a few pics below.